A team of Ms. Shivi Vijayvergiya and Mr. Nakul Narayanan (both belonging to MPP3) participated in the competition organized jointly by IIT Delhi and Ministry of Road Transport and Highway, Government of India. The competition titled iSafe involved identification of a black spot and to present a policy solutions to reduce accidents. MPP3 team from NLSIU was adjudged the 3rd best team in the competition. 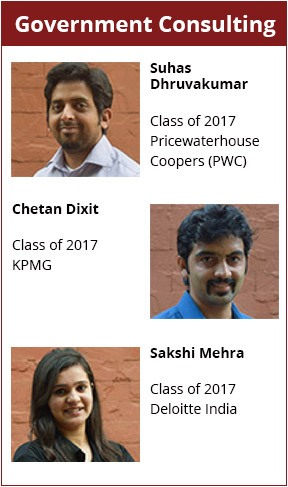 A team of three MPP4 students - Aarushi Gupta, Ishita Jain, and Yogaraj Mudalgi participated in the policy simulation competition organised by Network of Schools of Public Policy, Affairs, and Administration (NASPAA) on February 24, 2018. The Competition was held at 16 sites across the globe. The theme for the competition was ‘Pandemic Crisis Management and Global Health Security.’ All three candidates from MPP4 reached the final round of the competition held at the American University in Cairo. The team comprising of Ishita Jain was declared as the regional winner. Kavya Baradkar, Nakul Sharma, Genesia Rodrigues, Nissy Solomon and Srikant Ravikshanker Shyamala (all belonging to MPP4) drafted and presented a vision document for Melghat region during the one-day Convergence Meeting on October 28th, 2017. Shivi Vijayavergiya was conferred "VSO LIfe Changing Award" by Voluntary Services Overseas, India for the volunteering she dud in Rajasthan. The event was held on 5th December 2017 on International Volunteering Day at New Delhi. Trishal Kumar was Chief Adjudicator at Manipal Institute of Technology (MIT) Debating Tournament (12th - 15th August, 2017), RV Debating Tournament, Bangalore (2nd - 4th October, 2017) and Ramaiah Inter-Varsity Debating Championship (27 - 29th October, 2017). Trishal Kumar was finalist at the NALSAR Inter-Varsity Debate (17th - 19th September, 2017). Trishal Kumar was Champion at Indian Law Society's Parliamentary Debate, Pune (12th - 14th January, 2018) and International Institute of Information Technology (IIIT) Parliamentary Debate, Hyderabad (19th - 21st January, 2018). Manavi Das presented a co-authored paper at the XII International Conference on Public Policy and Management at IIM, Bangalore in 2017. The paper was titled ‘Engaging Local Resources to Achieve Secondary Education: Lessons from an Intervention in Western India’. Devarchan, Rohit C. H., Sattwika Ashok and Dwijaraj Bhattacharya participated in the RBI Policy Challenge 2016 and was adjudged as Best Entry at regional level. Sohom Dasgupta, Mantasha Husain, Sakshi Mehra, Neeraj Panicker, Snehil Singh and Arkalgud Ramaprasad presented a paper titled “Elderly health care in India” during the IIMA International Conference on Advances in Healthcare Management Services, December 2016. Mitra, A., & Ramaprasad, A. presented a paper on “Regulation of Medical Devices in India: An Ontological Analysis” during the 2nd International Conference on Advances in Healthcare Management Services, December 2016. Apoorva S. and Mansi Sharma presented a paper on “The perception of Sedition among the youth and the deafening roar of “Aazadi” at Lloyd Law College, Greater Noida in a conference organized by Law Commission of India and Commonwealth Legal Education Association, Asia during 5-6 November 2016. Kiran A. 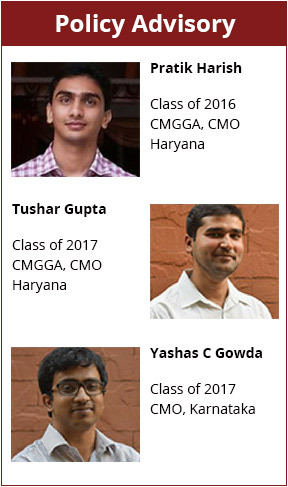 B., Akshay Kumar, Arkalgud Ramaprasad, Roshan Mishra, Siddharth Barpanda, Vivek Raj Anand presented a paper on “Decoding Election Manifestos in India: An Ontological Analysis” at ‘Fourth PAN IIM World Management Conference’ at IIM Ahmedabad, India during 12-15 December 2016. Kiran A. B., Anilkumar M, Chetan B. Singai presented a paper on “The Saga of Marginalisation of Tribal Communities in India: A Systemic and Systematic Policy Analysis” during the tnternational Conference on ‘Marginalisation, Poverty and Decentralisation’ at Kerala Institute of Local Administration, Thrissur, Kerala, India during 19-22 November 2016. Mounik Lahiri, Amrutha Jose Pampackal, and Simi Sunny attended exchange programme at Oslo University College, Norway as part of UGC sponsored Indo-Norway Collaboration Programme in October 2015. Kabir Arora presented a paper on 'Exploring Nayandhahalli as an ecosystem where waste is transformed into resource' in Switzerland as part of Trust and Integrity in the Global Economy conference in July 2016. 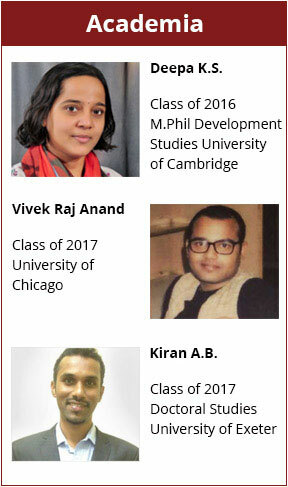 Shrikant Wad, Sharada S., Beni Chugh, and Vivek Raj Anand attended the Summer School in “The Philosophy, Politics and Economics” at IGIDR in May 2016. Sharada S. published a paper on "Charting a path forward for Internet access in India" (with Mike Godwin at the R Street Institute). Amrutha Jose Pampackal and Deepa K. S. were editorial assistants to the South Asian Alliance for Poverty Eradication's 2016 Poverty Report. Sharada S. was grand finals judge for Asian British Parliamentary Debate 2015 (October 2015). Sharada S. was adjudication core at the Malaysian National Novice Debating Championship 2016. 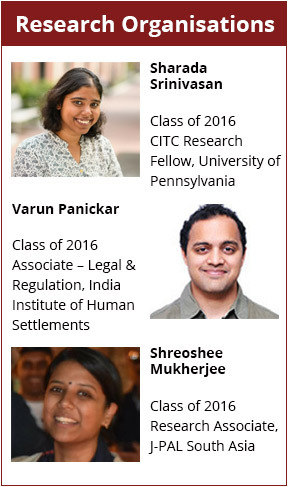 Sharada S. was Grand Finals Chair at the IIT Delhi Parliamentary Debate 2016 (February 2016). Sharada S. was women’s officer at Governing Council for the World universities Debating Championship, the largest British Parliamentary Debating tournament in 2016. Sharada S. was recipient of the global award for Amazon Euro-SSIG Fellowship 2015 for research and attendance at the Internet Governance forum at Brazil. Vivek Raj Anand and Beni Chugh attended summer school on 'Non-monetary dimensions of poverty' at Beijing Normal University in October 2015. Students of MPP won the overall trophy at the Christ University Economics Fest, Altius 2015. Ms. Rashmi Nayyar was awarded Ray Williamson Future Fund Award 2015, for supporting her studies at the International Space University in Adelaide, Australia. Shrikant Wad won the first prize for Policy Brief competition held at Tata Institute of Social Sciences, Hyderabad in 2015. Poem titled "Wall Paper" by Deepa K. S. was selected out of 300 entries from 33 countries through International Writing Contest organised by the British Council. The poem is published in the anthology titled Inspired by my Museum in February 2015. Mr. Dharmendra Singh, Mr. Anirudh T, Mr. Harsh Vardhan Sharma, Mr. Niraj Kumar, Mr. Srisagar were semi-finalists for the Geneva Challenge competition in 2015. Their paper was titled “Lone Peacock - The endless wait for the Mango Showers”. Deepa K. S. published a paper on “The Line of Resistance: Examining Decentralised Decision Making through PESA Act in the Vedanta Case, Niyamgiri," Journal of Law and Public Policy, Vol. 2: 238-252, July 2015. Ms. Swasti Raizada, Mr. Shrikant Wad and Ms. Avantika Gode participatned in the Youth BRICS Summit, 2015 held between 4-7th July 2015 at Kazan, Russia. Mounik Shankar Lahiri presentated a paper on 'The Political Economy of India's Informal Labour Market at the Xth International Conference on Public Policy and Management at Indian Institute of Management, Bangalore on 3rd August, 2015. Mr. Aniruth T. and Mr. Sasidhar S. won the most 'futuristic idea and innovation' prize for the idea pitched at the Microsoft international innovation camp during June 2015, held in Oslo as a part of the HiOA summerschool program. Mr. Varun Panickar published a paper on “State-sponsored Alcoholism in Kerala” in the Economic and Political Weekly, Vol. 50(23) on June 6, 2015. Sharada S. was Global Internet Governance Fellow at 9th European School on Internet Governance (Germany, 2015). Rashmi Nayar presented a paper at the Tenth Annual International Conference on Public Policy and Management, Indian Institute of Management, Bangalore during August 3-5, 2015. Title: "Use of GIS in Healthcare to Assist Policy Makers: A study on Malaria incidence in India". Sharada S. was EFL Grand Finals Judge at 40th Australasian Intervarsity Debate Championships (Daejon, South Korea - 15th-23rd July 2015). Deepa K. S. published a paper titled "The Daughter Disadvantage”, Kurukshetra, Vol. 63, No. 05: 3-5, March 2015. Sharada S. was quarter finalist at the Ronald H. Coase Interdisciplinary Public Policy Brief Competition (17th-19th March 2015). Deepa K. S. published a paper (with G. Raghuram) on "Goods and Services Tax: The Introduction Process", IIM Ahmedabad Working Paper, WP2015-03-01, March 2015. Sharada S. was adjudication core at the first Indian Women's Debate Championship 2015 (14th-15th March). Sharada S. was semi-final adjudicator at the Kuala Lumpur Open Challenge (December 2014). Deepa K. S., Nalini Kaushik and Srishti Pandey participated in the workshop titled "Beyond Income: Social Dimensions of Poverty" held at Beijing Normal University, China in collaboration with HiOA, Oslo during 1-5 October 2014. Sharada S. was best adjudicator at Gokhale Memorial Parliamentary Debate (September 2014).